Lyme Disease hit me unaware. For a couple years my knees were swollen, stiff and painful. That didn’t stop me from walking the dogs or kayaking, but the pain made everything a chore instead of fun. I was told it was arthritis and to lose weight and do knee exercises. After those couple years of knee pain the pain gradually went to my hips, back, shoulders and neck. Then it gradually intensified. It got to the point where the pain in my back was so bad I would be sitting at my desk at work and and tears would come to my eyes. I am far from a wimp. Eventually I couldn’t lift boxes, I couldn’t pick up a bag of dog food and I could barely do my job at work. I went to another doctor. I explained my pain. He told me I was getting old and I was overweight so this was to be expected. For jollies, I think to satisfy me that he had done all he could for me, he prescribed x-rays and told me to take Tylenol. Sure enough the x-rays showed I had a “little” arthritis. So he HAD to be right and I was a whiny, fat, old lady with no idea about real pain. I was told to take Tylenol and do exercises. I hurt so bad most days I couldn’t move…forget exercise. My problem was invisible. No one understood how much pain I was in. My daughter laughed at me when things I used to do like a superhero became difficult…as if I was trying to conceal my super powers. My friend agreed with the doctor and had little to no sympathy for me. On good days I kayaked. I hoped I would drown, because the pain of a “little” arthritis was more than I could bear and I didn’t want to know what a lot of arthritis would feel like. But I was a better paddler than I thought. I did a class three with brief moments of four stretch of river like it was flat water…not really. I just had a very stable boat and was lucky. I remember laughing hysterically as I was swept into the current at Zoar Gap. I was thinking we all die and if I had to go this would be a good death, besides, there was no way out. I was committed to the drop and hole before me. As I paddled through it I saw much more experienced paddlers swimming because they got dumped from their boats and I paddled on by like I was some kind of expert. For me paddling Zoar Gap was like “Rounding the Horn.” God, that was exciting! But I don’t ever have to do it again. Checked off the bucket list! After that a summer went by and things got worse. I was losing feeling in my face. Somehow I was biting the underside of my tongue. I couldn’t turn my head. I felt like I was being wrapped in a cocoon. Moving away from my core was nearly impossible. I kept working. On good days I walked the dogs. 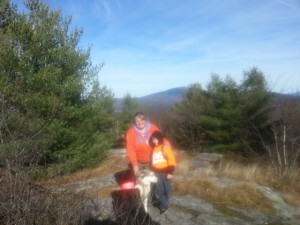 As long as the trails were flat and the dogs didn’t tug on the leash I could manage. I tried to be social. My friend and I went to King Richard’s Fair in Cedarville, MA. Whilst stumbling over tree trunks I managed to take on a hiker…a tick. It was on my back. It felt like a black fly bite. My friend looked at it and thought it was a bite. A week later it was still very itchy. My daughter was visiting so I asked her to look at it and she noticed a black dot in the center and thought it might be a tick. She tried to pull it out, but it wouldn’t release. I needed to go to the doctor to have it removed. The doctor needed a scalpel to cut it out. He prescribed a Lyme test. He said it would be negative because it takes a month before Lyme shows up. He just wanted to get a baseline to judge from. A day or two later I got a call and was told I was positive for Lyme. I was given an antibiotic…or something (the same drug they use for malaria) and within a few days I could turn my head at my neck. I stopped biting the underside of my tongue. I could hop down a set of stairs. I was so happy I was diagnosed with Lyme and that I wasn’t going to die from a “little” arthritis. I ran around with a smile on my face telling everyone I had Lyme disease. They thought it was odd that I was so happy about the diagnosis. I think Lyme disease took four years out of my life. I am left with a “little” residual arthritis. If I wasn’t saving my liver for Southern Comfort, I bet Tylenol would work for the leftover pain. When I went back to the doctor that diagnosed me with a “little” arthritis he told me I was lucky I got another tick bite. I told him to never put another patient through what I went through. I told him about my kayaking adventure and how I hoped to die rather than suffer with a “little” arthritis. I told him he should have taken my pain level as an indication it was more than a “little” arthritis instead of thinking I was old, fat and a wimp. I don’t usually speak so candidly. He thanked me for my opinion. I have a different doctor now. Here comes the religious part. After six years of being cured of Lyme Disease the chronic pain from the residual arthritis in my knees still bothered me. One Sunday before service I was complaining to my daughter about it. During the service the pastor suddenly stopped speaking and apologized to the congregation. He said, “ I am just getting the strongest feeling that I need to pray for people with chronic pain in their knees and other joints.” He started praying and asked anyone with joint pain to come to the altar for prayer. Some people went up. My daughter nudged me and I just smiled and told her, “Only say the word and I shall be healed.” Sure enough the pain in my knees was gone and hasn’t come back since. Don’t get me wrong, they are still stiff and sometimes I might twist one or the other and get an ache for a day, but the chronic pain is gone. Sometimes we need to remember God’s hand in our lives. 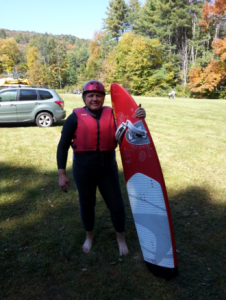 Paddling Zoar Gap will always be an accomplishment that I never would have attempted if it weren’t for Lyme. A little insanity helps with bravery. Doctors are just practicing. God is the ultimate healer. Join us in our Friends in the Fight Group to share your stories and connect with our community.